"This is a great fondant recipe that can be tinted with paste food color if desired. Pour over the top of cakes or petit fours to make a perfectly smooth and glossy surface. Excess fondant can be stored, tightly covered, in refrigerator for weeks. Reheat to use again. Recipe may be doubled or tripled." In a saucepan, combine confectioners' sugar, water and corn syrup. Cook over low heat, stirring constantly, until it reaches a temperature of 92 degrees F (33 degrees C.) Mixture should be thin enough to pour, but thick enough to coat cake. Stir in the almond extract. To cover cake: frost cake smoothly with buttercream (see Editor's Note) and place on a cooling rack with a cookie sheet underneath. Pour fondant over iced cake, flowing from center and moving out in a circular motion. Touch up sides with a spatula. Excess fondant can be stored, tightly covered, in the refrigerator for about four weeks. Reheat over a double boiler just until pourable. 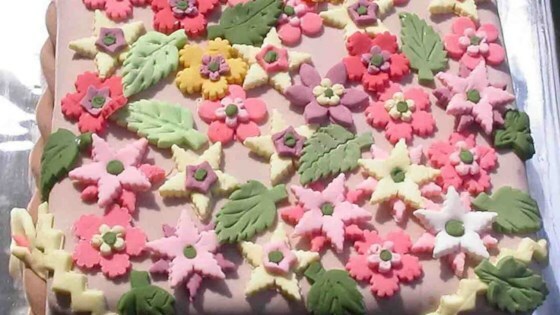 Decorate cakes and cookies with this delicious fondant. For best results, cakes or petits fours should be covered with a thin layer of seedless jam, almond paste, or a perfectly smooth layer of frosting before covering it with the fondant. The fondant will give the cake a smooth, glossy surface. For Chocolate Poured Fondant: follow recipe as directed, but increase water by 2 tablespoons. After fondant is heated, stir in 3 ounces of melted unsweetened or bittersweet chocolate, then add flavoring. We have updated this recipe due to a typo in the amount of water. It has been changed from 1 cup to 1/2 cup. Wonderful recipe for glazing petit fours, wouldn't use anything else.